In 2009 SCAR carried out a major assessment of how the climate of the Antarctic and Southern Ocean had changed in the past, how it might change in the future under a range of greenhouse gas emission scenarios and how these changes affect the biota. 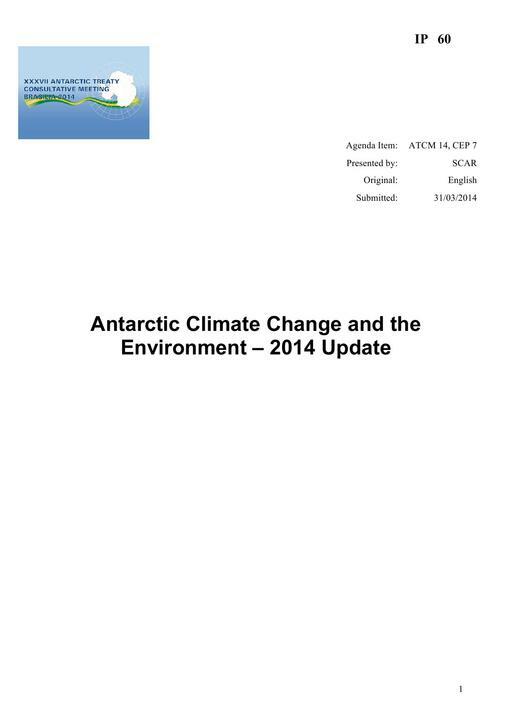 The work was published in November 2009 as the Antarctic Climate Change and the Environment (ACCE) report (Turner et al. 2009), with a summary appearing in the peer reviewed literature (Convey et al. 2009). At the request of the ATCM, SCAR agreed to provide regular updates (e.g. ATCM Resolution 4 (2010)), and in 2013 a major review of the ‘key points’ from the original ACCE report was published (Turner et al. 2013). The SCAR ACCE Advisory Group keeps abreast of recent advances in climate science, with a particular focus on Antarctic climate change and the biological implications of such changes. The present paper, prepared by the SCAR ACCE Advisory Group, highlights some notable advances in Antarctic climate science over the last 2 years. A comprehensive reference list is provided so that more details of particular research can be consulted.